If you only learn the name of one vaporizer manufacturer, make it Storz & Bickel. This company is considered the master in design even though it is one of the oldest brands in the industry. Their line of models is arguably the finest in the world, and one that every vape enthusiast should know about. Storz and Bickel has a long history of excellence in the world of vape design. Founded in 1996, the brand helped to pioneer the desktop vaporizer and is considered by many enthusiasts to be the gold standard of today. 1. Volcano Classic - remains one of the most popular desktop vaporizers on the market today. It was the vape that started it all and helped to make vaping what it is today. This desktop unit: heats herbs, produces vapor, and then blows the vapor into bags that you inhale from. Although many competitors have emerged since it was introduced, the Volcano is still considered by most people to be one of the best, if not the best vaporizer in existence. The model includes an analog dial for setting the temperature between 266 and 446 degrees Fahrenheit. 2. Volcano Digit - is an updated version of the original Volcano. While it works the same way, it offers the benefit of more precise temperature controls, compliments of an LED display. With this added feature, you can set the temperature to the precise degree you desire, and easily check the vape's current temperature. It uses the same basic Volcano parts, including the premium Volcano bags and remains to be a convection model that produces hot air and circulates it through aromatic blends to produce vapor. Then, the vapor travels to the top, filling balloons that you can draw from at your leisure. For our full review - click here. 3. Plenty - is a handheld vaporizer that runs on electricity like a desktop. A twisted coil mouthpiece allows you to draw directly from it without having to fill a bag first, but because the model runs on AC power, it offers the same incredible performance as the desktop models in the Storz and Bickel line. Able to rival the quality of the Volcano series, it is ideal for people who want to sit back, relax, and vape their herbs at home. For our full review - click here. 4. Mighty - is powered by two lithium ion batteries. Like its table top and handheld vaporizer brothers, the Mighty uses full convection set up to heat up herbs and waxes consistently and evenly. A digital display allows for precise temperature settings, plus it holds a large amount of material and has a long battery life. Designed to work best with dry herbs, you can set it to your precise temperature and a heat exchanger will keep its exterior cool to the touch throughout use. For our full review - click here. 5. Crafty - is much smaller then others, for those looking for the most compact vape possible. Powered by just one lithium ion battery, the convection vaporizer has two standard heat settings, which can be modified using a mobile app for an Android or iOS phone. The Crafty is much like the Mighty, only smaller. To keep the size compact, Storz & Bickel eliminated the digital display and instead of touching buttons to adjust the performance, you use a smartphone application to set the temperature. For our full review - click here. - Cutting Edge Research - as all Storz and Bickel products take years to develop. A design and engineering team spends months refining designs and perfecting products before they are deemed ready for sale. The company is always at work improving products and coming up with new ways to make vaping easier. - German Craftsmanship - even though it would be less expensive to manufacture overseas, the company produces all of their vaporizers in Germany to this day. As a result, you get the benefits of the German commitment to quality and can be sure that you're getting a well-made product in every box. - Safety Assurances - all of the vaporizers listed above have earned safety certifications to confirm that their products conform to DIN EN ISO 900 standards. The company is the only one in the world to have this distinction, testifying to just how well made their products and parts are. - Quality Replacement Parts - when maintained as recommended by the manufacturer, all 5 models, can truly stand the test of time. Listings above include parts like Volcano bags, as well as accessories like the high quality herb grinder. All of the offered replacement parts are priced competitively, and are 100% genuine from the manufacturer. If you'd like assistance selecting the right parts for your vape, we'll be glad to help. - Excellent Customer Service - each model comes with a manufacturer's warranty, and the company has an excellent reputation for standing behind their products. If anything goes wrong with one of their quality vaporizers, they are super quick to respond and offer a replacement or a repair. 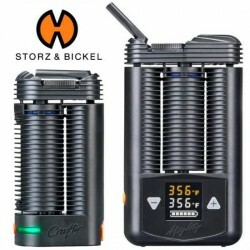 While Storz and Bickel vaporizers do cost more than other brands, the price difference is owed to the quality of the parts and the overall advanced nature of the products. Investing in a Storz & Bickel vape means investing in an excellent vaping experience. Whether you're looking for a desktop model like the Volcano, a handheld like the Plenty, or a portable like the Crafty or Mighty, you can trust any model to treat you to a truly exceptional vaping experience. Explore the complete collection above now to find the right vaporizer for dry herb, wax, or oil for your personal needs, or contact our customer service team here at VaporPlants.com for help selecting the right vape.